Members of the New York City culinary collective Ghetto Gastro give a tour of their stomping ground. It was a rainy day at Johnny’s Reef Restaurant on City Island, at the eastern edge of the Bronx, where four members of Ghetto Gastro had gathered for a feast of fried seafood. “Growing up, City Island was like the Hamptons for the hood,” said Jon Gray, a Bronx native and one of the three founders of the 25-person roving culinary group—a tribe, really—which stages pop-up dinners with a cult following around the world. He sipped a Henny-Colada—one part Hennessy and two parts piña colada, topped with a maraschino cherry and an American flag toothpick. “That was the weekend getaway. We’d go to Johnny’s Reef, do our thing. You might see some cats you had beef with. Or you might see ladies with a lot of cool vibes on the water.” In summer, the place fills up with locals who come for the fried lobster tails and fresh red snapper, as well as the uninterrupted view of Long Island Sound. Gray, a classic charismatic front-man, had come to give T+L a culinary tour of the Bronx. 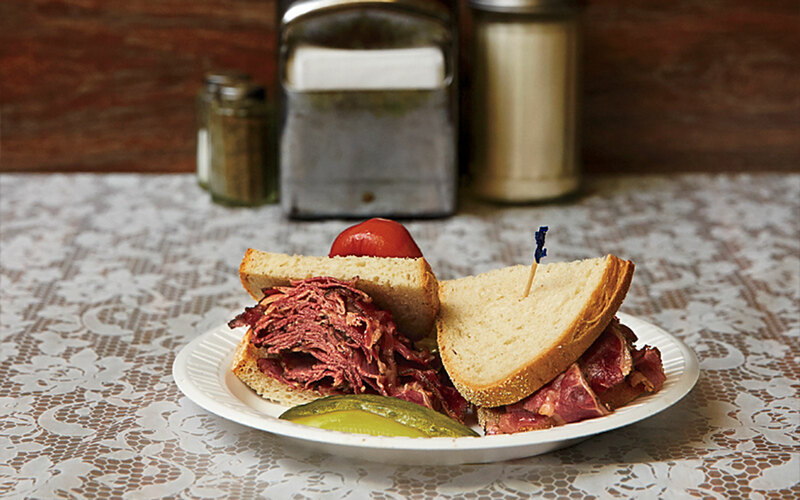 Though often overlooked as a dining destination, the borough is a source of pride for Ghetto Gastro, and is full of authentic food experiences that can easily compete with those of more frequently hyped Brooklyn and Queens. Gray dreamed up the idea of Ghetto Gastro in 2012—“The name came to me in a nap!” he said—after a stint designing a denim line. Along the way, he recruited two other Bronx-born chefs, Lester Walker and Malcolm Livingston II. 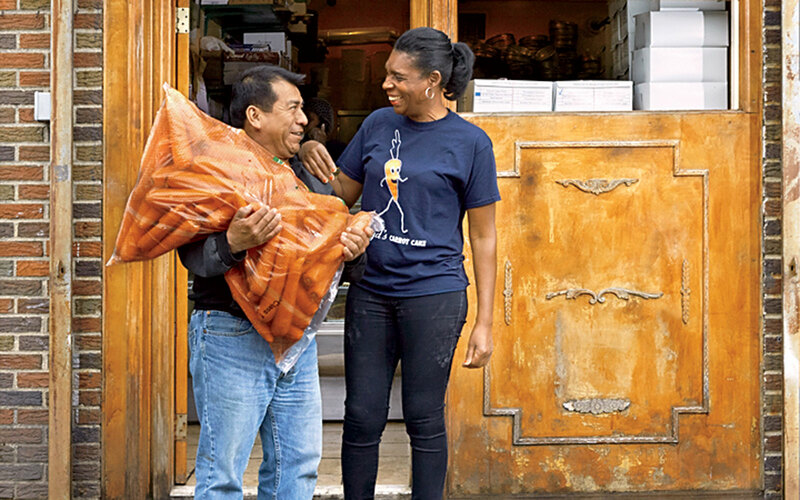 All three share a passion for food (as a teenager, Gray used to roam Manhattan with a Zagat guide) and a desire to connect Bronx culture with that of the rest of the world. Walker and Gray were old friends; Gray befriended Livingston when he learned Livingston was working at Wylie Dufresne’s acclaimed restaurant WD~50 (since closed). “I was like, yo, let’s link,” Gray said. "You hear the word ghetto and you think failure. ...We want to redefine what ghetto means. Our mission is to empower the youth, educate, and bring culture through food." The trio started throwing underground dinners for tastemakers in downtown Manhattan, and that gradually grew into a more global enterprise. In the past two years, Ghetto Gastro has staged dinners at Art Basel Miami, flown out to attend René Redzepi’s MAD Symposium in Copenhagen, and hosted a dinner at the Cannes Film Festival. Their events and food, which they promote by word of mouth and on social media, are inspired by both the Michelin-starred restaurants they admire, such as Osteria Francescana, in Modena, Italy, and the food they grew up eating at home. Their menus might include dishes such as “crab and cornbread,” a crab velouté with beluga caviar and a crunch of freeze-dried corn bread, and “swerve and turf,” a cut of Kobe beef with saffron-butter-poached lobster tail. But while their cooking has evolved, tending to their roots is still a big part of Ghetto Gastro’s mission. Gray, who manages the group full-time, often volunteers at community events (GG recently served ice cream for Africa’s Out, Wangechi Mutu’s LGBT initiative). “Making it out of the Bronx is a success, but let’s also make our neighborhood better,” he said. “You hear the word ghetto and you think failure,” Walker said. He now splits his time between the Bronx and Washington, D.C., where he cooks at the José Andrés restaurant China Chilcano. “We want to redefine what ghetto means. Our mission is to empower the youth, educate, and bring culture through food,” said Livingston via e-mail from Copenhagen, where he now works as Noma’s pastry chef. The three may lead far-flung lives, but they still make it a priority to meet up in the borough they grew up in, whether for broken rice at Com Tam Ninh Kieu or beef patties at Kingston Tropical Bakery. Some dishes are always worth returning home for. 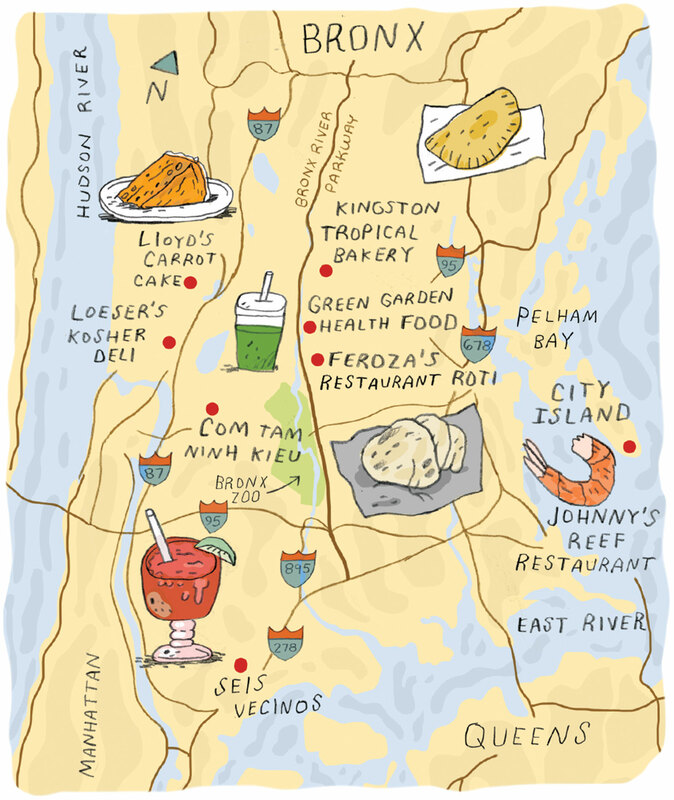 The chefs pick the borough’s best food, from global cuisine to New York classics. Kingston Tropical Bakery: The Bronx’s best coco bread, baked fresh every day. 4000 White Plains Rd. ; 718-798-0076. Green Garden Health Food: Fruit smoothies with a Rastafarian touch. Feroza’s Restaurant Roti: The place for Trinidadian chicken roti sandwiches and imported Caribbean soda. 716 Burke Ave.; 718-405-9081. 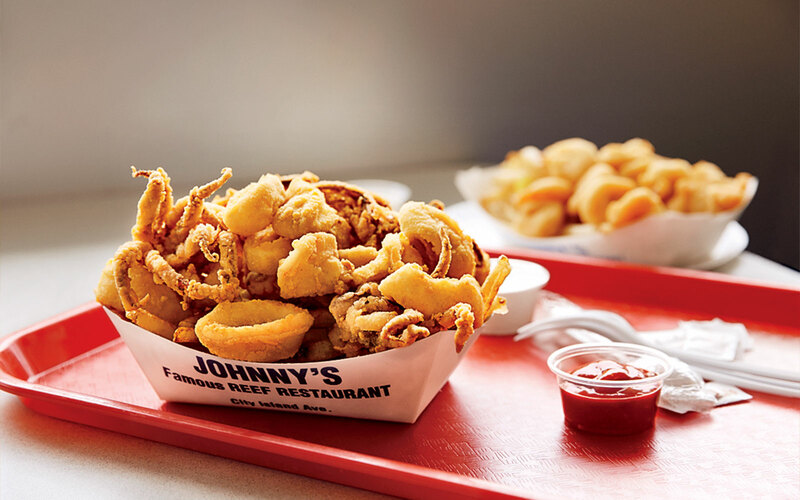 Johnny’s Reef Restaurant: Come for the seafood; stay for the view. Com Tam Ninh Kieu: Famous for its Vietnamese com tam (broken rice) with pork, egg, and shrimp cake. 2641 Jerome Ave.; 718-365-2680. 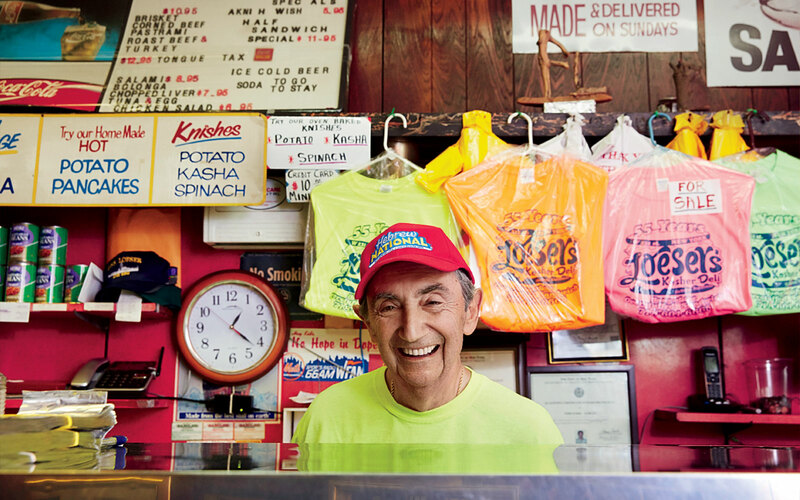 Loeser’s Old Fashioned Kosher Deli & Caterer: A pastrami sandwich to rival Katz’s. 214 W. 231st St.; 718-601-6665. Lloyd’s Carrot Cake: The bakery still uses an adapted version of the late Lloyd Adams’s mother’s recipe. Seis Vecinos: Serves Central American specialties like pupusas (Salvadoran savory pancakes) and marañón (cashew apple) juice.